During the development of rheumatoid arthritis (RA) autoantibodies to IgG-Fc, citrullinated proteins, collagen type II (CII), glucose 6 phosphoisomerase (G6PI) and some other self-antigens appear. Of these, a pathogenic effect of the anti-CII and anti-G6PI antibodies is well demonstrated using animal models. These new antibody mediated arthritis models have proven to be very useful for studies involved in understanding the molecular pathways of the induction of arthritis in joints. Both the complement and FcγR systems have been found to play essential roles. Neutrophils and macrophages are important inflammatory cells and the secretion of tumour necrosis factor-α and IL-1β is pathogenic. The identification of the genetic polymorphisms predisposing to arthritis is important for understanding the complexity of arthritis. Disease mechanisms and gene regions studied using the two antibody-induced arthritis mouse models (collagen antibody-induced arthritis and serum transfer-induced arthritis) are compared and discussed for their relevance in RA pathogenesis. Both genetic and environmental factors interact and contribute to the development of autoimmune diseases. One such disease debilitating joint architecture is rheumatoid arthritis (RA). Arthritis in the joint involves a multicellular inflammatory process, including infiltration of lymphocytes and granulocytes into the articular cartilage, proliferation of synovial fibroblasts and macrophages and neovascularization of the synovial lining surrounding the joints. This proliferative process not only induces swelling, erythema, and pain in multiple joints but also progresses to joint destruction and causes loss of bone density and architecture. Many cellular components (macrophages, dendritic cells, fibroblast-like synoviocytes, mast cells, eosinophils, neutrophils, T cells and B cells), cell surface molecules (adhesion molecules, integrins), signaling components (ZAP70, PTPN22, JAK, mitogen activated protein kinase and Stat1) and humoral mediators (antibodies, cytokines, chemokines, metallo-proteinases, serine proteases and aggrecanases) interact and aid in the disease progression, leading to digestion of extracelluar matrix and destruction of articular structures. The importance of B cells in RA pathogenesis stems not only from the original finding of high titers of rheumatoid factors (RFs), but also from the observation that arthritis is mediated in experimental animals via B cells and anti-collagen type II (anti-CII) antibodies [1–5]. Interest in studying the role of B cells in arthritis has returned as a result of successful anti-CD20 therapy [6–8]. In addition, the two widely used mouse models of antibody-initiated arthritis, collagen antibody-induced arthritis (CAIA; induced with anti-CII antibodies) and the newly developed serum transfer-induced arthritis (STIA; induced with anti-glucose 6 phosphoisomerase (anti-G6PI) anti-sera) have been better characterized. B cells can contribute to the disease pathogenesis as antigen presenting cells, through costimulatory functions (surface molecules and secreted cytokines), by supporting neolymphogenesis, as well as through its secretory products, immunoglobulins. In RA, autoantibodies provide diagnostic and prognostic criteria, and serve as surrogate markers for disease activity (RFs, anti-citrullinated protein antibodies (ACPAs)), and may play a requisite role in disease pathogenesis (anti-CII and anti-G6PI antibodies). The contributions of antibodies to the disease are initiated by their direct binding to their respective antigens and involve immune complex formation, deposition, and activation of complement and Fc receptors (FcRs). Modulation of circulating immune complexes and pathogenic antibodies by simple removal using therapeutic plasmapheresis or depleting B cells with the antibody rituximab acting via complement-dependent and antibody-dependent cell-mediated cytotoxicity through the induction of apoptosis and inhibition of cell growth proved to be beneficial . In RA patients, prevalence of anti-G6PI antibodies is low and may occur in only severe RA . Levels of anti-CII antibodies are more commonly detected; however, varying levels of prevalence of anti-CII antibodies in RA that are dependent on the nature and source of CII used for assay and the phase of the clinical disease have been observed. For example, seropositivity for antibodies to native CII (approximately 14% to 48%), denatured CII (approximately 50% to 87%), and cyanogen bromide fragment 10 (CB10; 88%) were observed in RA patients' sera [11–15]. Similarly, the IgM antibody against the Fc part of the IgG antibodies (RF) has been consistently associated with RA (80% seropositivity), but it has also been reported to be present in normal individuals as well as during other chronic inflammatory conditions . The importance of RF in RA is yet to be clearly ascertained. It can form immune complexes in the joint that could fix complement and release chemotactic factors, such as C5a, which in turn could attract neutrophils. Activated neutrophils can ingest immune complexes, releasing various proteases and oxidative radicals that destroy the cartilage matrix. The synovium itself is a rich source for the production of complement proteins and RF . On the other hand, RF can also protect the joint by masking the epitopes from the arthritogenic antibody binding. Similarly, ACPAs have been shown to be specifically present in RA patients . However, as with RF, it is not yet known if ACPAs are merely a consequence of the inflammatory process rather than being responsible for initiating or perpetuating it . Although ACPAs were not detectable in earlier studies with collagen-induced arthritis (CIA) [20, 21], a recent study reported the presence of these antibodies during the early phase of CIA . Furthermore, an anti-cyclic citrullinated peptide monoclonal antibody (mAb) was shown to enhance the arthritis severity induced by an anti-CII mAb cocktail , suggesting ACPAs contribute to the severity of the disease. It is not yet clear, however, whether the induction of arthritis is due to the binding of citrullinated epitopes or cross-reactivity to other epitopes within the joints. The importance of Ig glycosylation status on its biological function and structure has been reviewed in detail . An association between RA and an increase in IgG glycoforms lacking galactose in the Fc region has been demonstrated [24, 25], which correlated with disease activity . Subsequently, passive transfer of an acute synovitis in T-cell-primed mice was reported to be enhanced by an agalactosyl glycoform of anti-CII antibodies . Recent studies also demonstrate the impact of differential Fc sialylation on pro- or anti-inflammatory activities of IgG . A basic understanding of disease mechanisms is a prerequisite for finding effective therapy with minimized side effects. Animal models provide opportunities for detailed analysis of similar disease pathways operating during early, intermediate and late stages of the development of human arthritis, although they will not be identical to those of RA. On the other hand, RA itself is not a single disease but a syndrome that includes different disease phenotypes. Thus, one should look for similar or common disease pathways involved in the disease development. Immunization of rodents and primates with CII in adjuvant induced an autoimmune arthritis, the so called CIA that, in many ways, resembles RA [29–32]. CII is the major constituent protein of the cartilage of diarthrodial joints, the site of inflammation in RA, and immunity to CII can be detected in RA patients [11, 12, 33–36]. The major B cell epitopes are spread over the triple helical part of CII (cyanogen bromide (CB) fragments 8 to 11). The B cell hybridomas generated in our lab against CII mainly recognized six major epitopes (J1, C1III, U1, D3, F4 and E8); mAbs to these epitopes have been well characterized [37–44]. Single or combinations of these mAbs induced arthritis in naïve mice [5, 45–47]. In vitro studies with anti-CII mAbs showed that these antibodies could be pathogenic to chondrocytes even in the absence of inflammatory mediators, being involved in impaired cartilage formation , strong inhibition of collagen fibrillogenesis  and disorganization of CII fibrils in the extracellular matrix with or without increased matrix synthesis . Furthermore, these mAbs also had deleterious effects on the pre-formed cartilage . These findings show that the antibodies initiate the pathogenic events even before the inflammatory phase. Arthritis can be transferred to naïve mice using serum from arthritic mice [1, 52] or a human RA patient , or with a combination of CII-specific mAbs [2, 3, 5] or a single mAb . Arthritis produced by passive transfer of CII mAbs resembles actively induced CIA but in an acute form (Figure 1) with a much more rapid onset (24 to 48 hours). Usually, arthritis subsides completely after a month and mice become normal. Lipopolysaccharide enhances the incidence and severity of the antibody initiated disease by decreasing the threshold for arthritis induction, bypassing epitope specificity, and increasing pro-inflammatory mediators and activation of complement components via toll-like receptor 4 signaling [3, 5, 54]. It is also possible to induce relapses with single mAbs in the mice that had previously developed chronic CIA , demonstrating the role of antibodies in relapses during the chronic phase of arthritis. Cartilage disrupted as a result of genetic disorders could be more accessible and vulnerable to an autoimmune attack by pathogenic antibodies, which was emphasized by the recent observations of enhanced cartilage-specific antibody binding and, thus, arthritis severity in mice with collagen type IX deficiency . Antibody-mediated arthritis in mice. (a) Collagen antibody-induced arthritis disease curve in BALB/c mice. A cocktail of arthritogenic mAb (M2139 + CIIC1), isotype control (L243 + G11) or phosphate-buffered saline (PBS) was intravenously injected on day 0 (n = 10 to 12). All the mice received lipopolysaccharide (50 μg/mouse intraperitoneally) on day 5. Arthritis was monitored for 30 days. None of the control mice developed arthritis. Clinical arthritis on day 10 was shown (b) after antibody transfer in B10.RIII mice (left, normal paw; right, arthritis paw), and (c) after antibody transfer and lipopolysaccharide injection in BALB/c mice (left, arthritis paw; right, normal paw). N, number of mice in each group. Error bars denote standard error of the mean. CAIA susceptibility is major histocompatibility complex (MHC) independent [1, 5]. Severe combined immunodeficient (SCID) mice develop arthritis , as do T or B cell deficient mice, but T and B cell double deficient mice have less severe arthritis , suggesting a regulatory role for these cells at the effector level. Cytokines and their interacting functional capabilities play a pivotal role in the development of RA. The pro-inflammatory cytokines tumour necrosis factor (TNF)-α and IL-1 are critical mediators in the inflammatory process of arthritis [57, 58], and neutralizing these effector cytokines has proven successful in the treatment of RA. Like RA, the inflammatory response in the arthritic mouse joint is predominantly mediated by these pro-inflammatory cytokines , all of which have been successfully targeted to down-regulate the disease . These antigen-presenting cell-derived cytokines and chemokines (TNF-α, IL-1β and macrophage inflammatory protein (MIP)-1α, but not IL-6) have been reported to be required for CAIA induction as well . Overexpression of oncostatin M in the mouse joints induced synovial pathology  and anti-oncostatin M treatment suppressed arthritis , except in one study in which human oncostatin M treatment was shown to inhibit CAIA . However, human but not mouse oncostatin M binds the leukocyte migration inhibitory factor receptor and human oncostatin M did not bind to the mouse oncostatin M receptor . Recently, the transcription factor T-bet has been shown to modulate antibody-induced arthritis through its regulatory function on IL-1β and chemokine production by dendritic cells . On the other hand, T cell secreted cytokines could be detrimental or protective to the joints, perhaps depending on the phase of the clinical disease. IL-4 is perceived as an anti-inflammatory cytokine; however, under certain circumstances it may function as a pro-inflammatory cytokine. Earlier, we found that IL-4 deficiency protected mice from CAIA [66, 67]. Neutralization of interferon-γ relieved the suppression of antibody mediated arthritis induced by anti-IL-4 treatment  and IL-10 promoted the disease in the B10.Q genetic background . Interferon-β deficiency exacerbated the disease; stromal cells and osteoclasts might be responsible for this . Thus, efforts to counteract the pre-existing inflammatory cytokines in RA patients by inducing anti-inflammatory cytokines or neutralizing pro-inflammatory cytokines should be critically evaluated before considering this form of therapy. Depletion of neutrophils significantly reduced the severity of CAIA , while disruption of the gp49B gene enhanced the disease . A positive regulatory role for CD69 in neutrophil function during arthritis induction in CAIA was reported , but a recent study ruled out such a significant stimulatory role for it . Antileukoproteinase, an inhibitor of neutrophil protease, completely abolished the disease  by inhibiting leukocyte attachment to the synovial endothelium , but the disease modifying anti-rheumatic drug methotrexate did not . Transdermal photodynamic therapy reduced the clinical arthritis and synovial inflammation in CAIA . Macrophage migration inhibitory factor induces the production of a large number of pro-inflammatory molecules and may have an important role in the pathogenesis of RA by promoting inflammation and angiogenesis. Deficiency in it decreased arthritis development significantly, possibly via matrix metalloproteinase (MMP)13 and neutrophil infiltration through MIP-2 . Similarly, MIP-1 family members orchestrate inflammatory host responses mainly by recruiting pro-inflammatory cells, and MIP-1α (CCL3) null mice were found to be protected from CAIA . Plasminogen deficient mice were resistant to CAIA but, upon reconstitution with plasminogen, arthritis was restored, demonstrating that active plasmin is essential for the pathology . Dipeptidyl protease I and two of its substrates, neutrophil elastase and cathepsin G, contribute to joint inflammation . Interestingly, reduced arthritis severity was observed in both the α1-integrin deficient mice and in the naïve mice pre-treated with an α1 integrin blocking mAb . Nitric oxide synthesized by nitric oxide synthases is implicated in the pathogenesis of arthritis. However, in CAIA, deletion of the gene encoding nitric oxide synthase-2 did not affect inflammation, although cartilage degradation was reduced substantially . On the other hand, cyclooxygenase (COX)2 is a key enzyme involved in the metabolism of arachidonic acid to prostaglandin H2, which is converted to biologically active prostaglandins (PGs), such as PGE2. COX2 is critical for arthritis induction . Furthermore, the PGE2 receptor EP4, but not EP1, EP2 and EP3, is essential in CAIA , whereas microsomal PGE synthase 1 deficient mice  and prostacyclin (PGI2) receptor deficient mice  had reduced arthritis. Interestingly, MMP2 and MMP9 had opposite roles , JNK-2 (c-Jun amino-terminal kinase-2) is not critical  and the role of osteopontin is still controversial [89, 90]. Antibodies, particularly as constituents of immune complexes, play a central role in triggering inflammation in a number of autoimmune diseases . It has been proposed that immune complexes initiate inflammatory responses either via activation of the complement system  or, alternatively, by the direct engagement and activation of FcR-bearing inflammatory cells . Several factors could influence the relative contributions of complement versus FcR inflammatory pathways to the immune complex-triggered inflammatory response. These include antibody isotype and titer as well as the site of immune complex deposition. With respect to the Ig isotype, FcR mechanisms could predominate, with immune complexes comprising non-complement-fixing antibodies, or, after deposition, in sites with abundant resident FcR-bearing inflammatory cells. Conversely, complement-driven inflammation may dominate when immune complexes containing Ig-constant regions are poorly bound by FcR or when leuko-cytes must be attracted to an inflammatory site. In addition, antibody titer may influence humoral pathways of inflammation. For example, it has been shown that the complement dependence of antibody-mediated renal inflammation is lost at higher antibody doses . Immunoglobulins mediate pro- and anti-inflammatory activities through the engagement of their Fc fragment with distinct FcγRs. In CAIA, mice lacking the common FcRγ-chain are highly resistant [45, 95], but FcγRIII deficient mice are only partially resistant . Absence of FcγRIIb in DBA/1 mice exacerbates the disease , but this is not the case in the BALB/c background . More rapid and severe arthritis was observed with single injection of anti-CII mAbs in Tg mice expressing human FcγRIIa . Complement components could play several important roles in the antibody-mediated disease, such as: opsonization for effective phagocytosis; in immune complex clearance (C3b and C4b) by binding to complement receptors on red blood cells, which transport the complexes to the liver and spleen where they give the complexes up to phagocytes for destruction; as inflammatory activators (C5a, C4a and C3a) inducing vascular permeability, recruitment and activation of phagocytes; and in lysis (membrane attack complex). Complement factor 3 and, to an extent, factor B , C5 [98, 99] (KS Nandakumar and colleagues, unpublished observations) and C5aR  are required in recipient mice. Deposits of IgG and C3 are found after the serum transfer . Interestingly, C3 depletion of recipient rats with cobra venom factor prevented passive transfer of arthritis with anti-CII antibodies . Similarly, C3 deficient mice developed less severe disease compared to C3 sufficient mice, although both systemic and local C3 and C5 cleavage would be absent in these mice . In immune complex diseases, C3 is important in both dissociating larger complexes into smaller units and mediating removal of complexes through the clearance pathway involving erythrocyte or platelet immune adherence receptors . Lack of sufficient C3 may lead to a redistribution of immune complexes into tissues, with activation of other pathways of inflammation. However, C3 inhibition/deletion targeted to the site of tissue injury may provide considerable local anti-inflammatory effects without the possible complications of systemic complement depletion , apart from complete inhibition of the complement cascade. 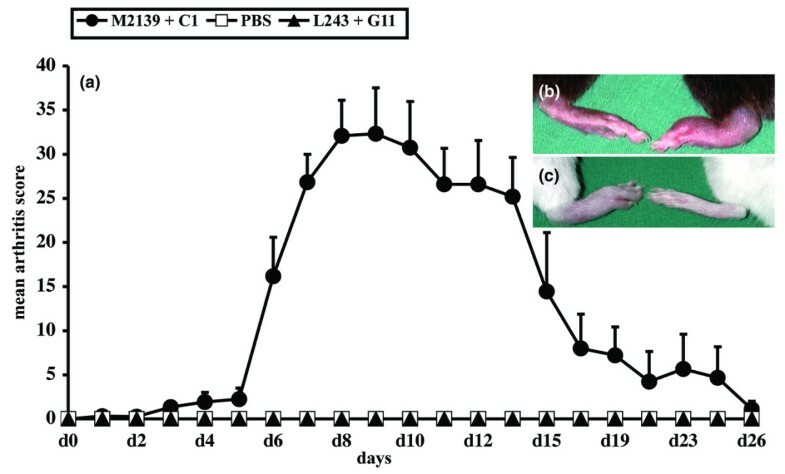 Furthermore, arthritis did not develop in C5-deficient B10.D2 mice after passive transfer of anti-CII antibodies, in spite of abundant IgG and C3 deposition on the cartilage surface . Similarly, C5 deficient congenic animals did not develop the antibody-initiated disease (KS Nandakumar and colleagues, unpublished observations). The C5 breakdown product, C5a, is the most potent anaphylatoxin and a powerful chemotaxin for neutrophils and monocytes, with the ability to promote margination, extravasation, and activation of these cells . Activation by C5a induces the release of multiple additional inflammatory mediators . C5a levels are markedly elevated in the synovial fluids of patients with RA , and a selective C5a receptor antagonist is inhibitory to immune complex-induced inflammation . It is of interest to note that both the anaphylotoxins C3a and C5a induce translation of IL-1 and TNF-α (effector cytokines in CAIA) in monocytes, but transcription requires an additional signal, such as lipopolysaccharide or IL-1 itself [109, 110]. Presumably, inflammatory cell recruitment to the joint by C5a or other complement-induced chemotactic factors might be required for disease initiation. Interestingly, C5a binding to C5aR induces the expression of activating FcγRIII while down-modulating inhibtory FcγRII on macrophages, which demonstrates how these two key components of acute inflammation can interact with each other in vivo . Recently, it has also been shown that C5a can down-modulate toll-like receptor-4-induced immune responses , indicating the complexity of interactions in the immune response. 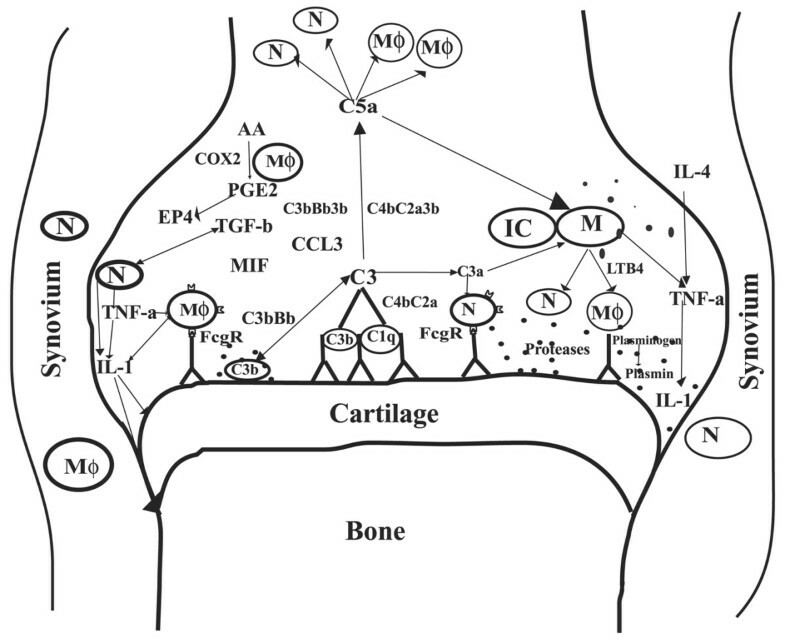 The possible interactions of immune effector cells in the inflammatory phase of the arthritic joint are depicted in Figure 2. Possible interactions of effector molecules in the collagen antibody-induced arthritis joint. AA, arachidonic acid; C1q, C2a, C3, C3a, C4b, C5a and B (factor B), complement components; CCL3, chemokine (C-C motif) ligand 3; COX2, cyclooxygenase-2; EP4, prostaglandin receptor; FcγR, Fcγ receptor; IC, immune complex; IL, interleukin; LTB4, leukotriene B4; Mφ, macrophages; M, mast cells; MIF, macrophage migration inhibitory factor; N, neutrophils; PGE2, prostaglandin E2; TGF, transforming growth factor; TNF, tumour necrosis factor. The F1 progeny (KBN) of KRN T cell receptor (TCR) (recognizing bovine RNase presented by Ak) transgenic mice and non-obese diabetic (NOD) mice carrying the MHC class II allele Aβg7 spontaneously develop severe peripheral arthritis beginning at about three weeks of age . T and B cell autoimmunity to the ubiquitous glycolytic enzyme G6PI was found to be the driving force in this disease model. Appearance of KRN transgenic T cells in the periphery correlated with disease onset [113, 114]. The KRN TCR recognizes a peptide derived from G6PI (residues 282 to 294) in the context of Aβg7 [115, 116]. After the initiation, the disease proceeds due to the presence of high levels of anti-G6PI antibodies. It was clearly shown that the arthritis was mediated by G6PI antibodies . The development of arthritis in the KBN mice, but not the anti-G6PI serum-induced arthritis, is critically dependent on IL-4 , explaining the dominance of antibodies of the IgG1 isotype specific for G6PI. Neutralization of TNF-α (starting at three weeks of age) did not prevent the disease in KBN mice . Recently, it has been shown that immunization with recombinant G6PI-induced arthritis in naïve mice , and that a genetically dependent chronic arthritis eventually developed . Naïve mice injected with KBN serum , affinity-purified polyclonal anti-GP6I antibodies  or a combination of two or more anti-G6PI mAbs  induced arthritis. Purified anti-G6PI transferred into the mice localized specifically to distal joints in the front and rear limbs within minutes of injection, saturated within 20 minutes and remained localized for at least 24 hours ; the accumulation of immune complexes seems to be possible due to the lack of decay-accelerating factor in this tissue . The predominant isotype of the antibodies present in the KBN serum is γ1 and severe arthritis is maintained if repeated injections of serum are given . Degranulation of mast cells was apparent within an hour  and influx of neutrophils was prominent within one to two days ; synovial hyperplasia and mono-nuclear cell infiltration, with pannus formation and erosion of bone and cartilage, began within a week [121, 126]. Arthritis caused by KBN serum transfer is MHC independent. Also, T and B cells are not required since arthritis developed in RAG1-/- mice . A single injection of anti-G6PI antibody caused prolonged and more severe arthritis in B cell-deficient (μMT) KBN mice . Mice depleted of neutrophils using anti-Gr-1 (RB6) antibodies are resistant  and neutrophil expression of leukotriene B4 receptor BLT1 was reported to be absolutely required for arthritis generation and chemokine production in this model . Similarly, mice lacking macrophage-like synoviocytes (op/op mice) are not susceptible . In addition, mice depleted of macrophages by clodronate liposome treatment were completely resistant. Reconstituting these mice with macrophages from naïve animals reversed this resistance . A recent report implicated a novel role for cyclin-dependent kinase inhibitor p21 in regulating the development and/or differentiation of monocyte populations that might be crucial for the induction of inflammatory arthritis . Furthermore, CD40L deficient mice were resistant . Intravenous immunoglobulin (IVIG)-induced expression of FcγRIIB in macrophages but not in neutrophils protected the mice from the disease. Arthritis induction but not IVIG protection was observed in colony stimulating factor-1-deficient mice (op/op), demonstrating that colony stimulating factor-1-dependent macrophages were responsible for IVIG protection in this antibody-induced arthritis model . Mice having mutations in the stem cell factor receptor, c-kit (W/Wv), or its ligand, stem cell factor (Sl/Sld), leading to mast cell deficiency, are resistant, and susceptibility can be restored by reconstitution with mast cell precursors [125, 131]. TNF-α- and IL-1R- but not IL-6-deficient mice were resistant to disease induction by KBN serum [132, 133], but TNF receptor 1- and TNF receptor 2-deficient mice were susceptible . IL-4 is dispensible for STIA . Gene-disrupted or congenic mice were used to delineate the roles of complement components: factor B, C3, C5 and C5aR are essential, but not C1q, C4, mannose binding lectin-1, C6, CR1, CR2, and CR3 [134, 135]. Thus, it has been concluded that activation through the alternative pathway leading to the generation of C5a is important in STIA. Mice lacking the common chain FcRγ were reported to be more resistant than those lacking only FcγRIII . Different results were obtained with FcγRII-deficient mice; either they had no effect , or had an earlier onset and greater severity of disease after KBN serum transfer . The neonatal MHC-like FcR (FcRn) is also required for the antibody transferred disease and resistance is associated with a very short circulating half-life of the transferred antibodies . Natural-killer T cells promoted this antibody-mediated inflammation . Recently, a genetic polymorphism of the IL-1β gene was shown to be important in the serum transferred disease . Interestingly, IVIG treament or anti-murine albumin antibodies protected mice against KBN serum-induced arthritis , suggesting the importance of FcR interactions in arthritis pathogenesis. Recently, anatomically restricted macromolecular vasopermeability dependent on vasoactive amines has been shown as one of the bases for the selectivity of the immune complex-facilitated antibody access to the joints . Furthermore, a role for the pro-apoptotic Bcl-2 protein Bim, but not Bak and Bax, in the effector phase of RA was also demonstrated . It is clear that antibody-induced arthritis induced with antibodies to CII shares many characteristics with that induced with G6PI. There are, however, some differences, although a direct experimental comparison has not yet been published, and most data for CAIA have been generated with purified mAbs specific for CII epitopes whereas data on STIA were generated with highly arthritogenic sera from the KBN mouse. Another limitation is that most studies with STIA use IgG1 antibodies whereas studies of CAIA involve antibodies of other IgG isotypes. This could possibly explain why STIA is exclusively dependent on the alternative complement pathway, whereas in the induction of CAIA both the classic and alternative pathway may occur. It might also explain the different results with respect to the dependence on FcR in the two models. Anti-G6PI serum is clearly more effective at inducing arthritis than anti-CII mAbs. This could be due to the polyclonality of the anti-G6PI serum as anti-G6PI mAb transfer also seems to be less efficient. In addition, different anti-CII antibodies have different arthritogenicity, related to their epitope specificity, and it is likely that the optimal mAbs have not yet been identified. Obviously, the anti-G6PI and anti-CII antibodies have different antigen specificity and this leads to different localization in the joints. Both types of antibody rapidly bind to the cartilage surface in vivo [38, 40, 123], but arthritogenic anti-CII antibodies penetrate the cartilage to reach chondrocytes , whereas the anti-G6PI antibodies also bind to synovial tissue . The functional consequence is, however, not clear but it is possible that anti-CII antibodies cause pathology even before activating the inflammatory response. Identification of gene regions promoting and inhibiting arthritis will ultimately not only unravel the candidate genes but also help to dissect the molecular pathways involved in the disease pathogenesis. Earlier, we identified the biological significance of the genetic contamination present in the MHC congenic mouse strains in a locus on chromosome 10. The contaminating RIIIS/J gene region present in chromosome 10 and 17 promoted CAIA , whereas in the congenic mouse strain the RIIIS/J gene fragment on chromosome 3 inhibited it . The NOD gene region on chromosome 2, containing complement factor 5, and on the distal region of chromosome 1, containing FcγRs, influenced both antibody-induced arthritis models  (unpublished observations). 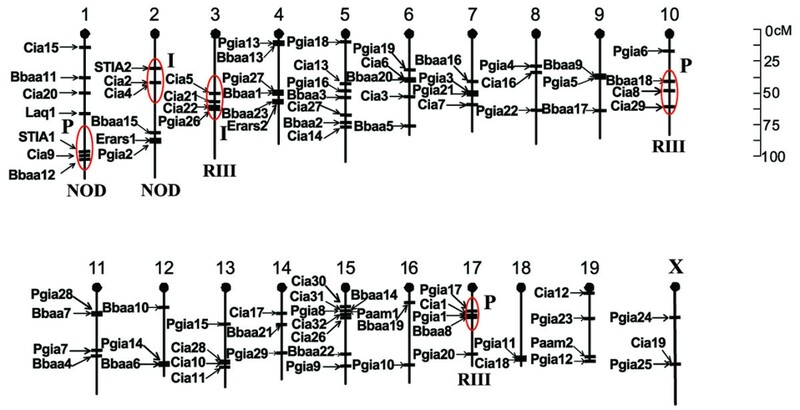 Several different mouse crosses were used in different arthritis models to identify arthritis associated quantitative trait loci (QTL). Arthritis QTL identified so far  using various arthritis mouse models are summarized in Figure 3. Interestingly, many of these gene regions are located densely in just a few chromosomes, suggesting that the identified QTL might represent complex loci containing various genomic variants, each of which functions individually or through interactions to modulate disease phenotypes in each of the different models. Alternatively, they may also represent single polymorphic alleles that regulate disease expression by a similar mechanism in multiple models, as is proposed by studies with experimental models of insulin-dependent diabetes mellitus and autoimmune encephalomyelitis . For some complex QTL, the responsible polymorphism may reside within a regulatory locus or an encoded transcription factor that governs the simultaneous up-regulation or down-modulation of several genes with the capacity to alter inflammation and autoimmunity . Gene regions in mouse that promote (P) or inhibit (I) collagen antibody-induced arthritis (CAIA). CAIA was promoted by NOD (cia 9 quantitative trait locus (QTL)) and RIIIS/J (cia 8 and cia 1 QTL) genes, and inhibited by NOD (cia 2 QTL) and RIIIS/J (cia 5 QTL) genes. Disease modulating QTL from other arthritis mouse models are given in the background to demonstrate the co-localization of QTL. Bbaa, Borrelia burgdorferi-associated arthritis; Cia, collagen-induced arthritis; Erars, erosive arthritis susceptibility; Laq, lupus-associated arthritis QTL; Paam, progression of autoimmune arthritis in MRL mice; Pgia, proteoglycan-induced arthritis; STIA, serum transfer-induced arthritis. Animal models for arthritis reveal that breakdown of tolerance by disruption of homeostasis or active immunization leads to disease development in which both T and B cells are essential, but not when preformed antibodies or T cells are used for disease induction. Antibody-induced arthritis models provide an opportunity to study the inflammatory phase of arthritis without involving the priming phase of the immune response. At the effector level, different pathways of complement activation and FcγR engagement are necessary for clinical disease. The fact that the common γ-chain of the FcR promotes arthritis while FcγRIIb is inhibitory is now clearly demonstrated. Recently, IgG2a and IgG2b antibody binding common γ-chain dependent activating Fc receptor (FCγRIV) that maps in between FcγRII and FcγRIII on chromosome 1 has been indentified . More studies are needed to address the importance of FcRIV in different arthritis models. Antigen-presenting cell-derived cytokines, TNF-α and IL-1β, have been proved to be important for arthritis induction and perpetuation. T cell secreted cytokines could be detrimental or protective to the joints, possibly depending on the phase of the clinical disease. Effector cells of the innate immune system (neutrophils, macrophages and mast cells) drawn to the inflammatory foci by different chemokines and chemoattractants are actively engaged in these models to induce inflammation, inflict damage on the cartilage and perpetuate the ongoing immune responses by secreting cytokines and proteases. Once the stimuli (anti-CII antibodies in the case of CAIA) have been nullified, the mouse recovers. However, if epitope spreading and release of unexposed antigens or antigenic modifications continue within the joint it may drive the disease to the chronic stage, with complete distruption of joint architecture. Thus, dissecting the fine specificity of the molecules taking part in the pathogenesis and understanding both the upstream and downstream molecular events involved in the disease process using animal models would be more interesting and valuable for effective development of therapeutic strategies. With the recent advances in our knowledge and techniques in various scientific disciplines, the possibility of developing novel therapies for RA is all the more promising.